WASHINGTON — President Donald Trump’s company said Thursday that it has been turning over documents for months in response to requests from the special counsel looking into Russian election interference and possible coordination with Trump associates. Trump said last year that special counsel Robert Mueller would be crossing a red line by looking into his personal finances — and those of his family — that are not related to Russia. The Trump Organization is made up of hundreds of companies owned by Trump through a trust and managed by his two adult sons. On Thursday, an attorney for The Trump Organization said in a statement to The Associated Press that the company has been “fully cooperative” with Mueller’s investigation since July 2017. The company has been in routine contact with the prosecutors, turning over documents and regularly discussing the scope of requests. Combined, they have provided more than a million pages of documents to investigators. “This is old news and our assistance and cooperation with the various investigations remains the same today,” said Alan Futerfas, who represents the company. 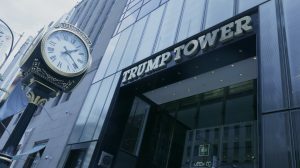 The statement came in response to a report by The New York Times that The Trump Organization had received a subpoena from Mueller that included a request for documents related to Russia. Asked Thursday about the subpoena and the president’s red line comments made to the Times last year, White House press secretary Sarah Huckabee Sanders referred questions to the Trump Organization. “We’re going to continue to fully cooperate out of respect for the special counsel,” Sanders said. The president has previously declined to say whether he would fire Mueller if he did look into his finances. Mueller has had similar negotiations over records, including some that involve subpoenas, with dozens of attorneys, companies and people involved in the investigation. Attorneys and witnesses involved in various parts of the investigation have described weekly and even daily phone calls with Mueller’s prosecutors when they want specific information. In addition to the company’s record production, the White House and the Trump campaign combined have provided more than a million pages of documents to Mueller’s investigators.